Belle On Trend: Valentine's Day Gifts (under $100!) for the Men and Women in Your Life! Valentine's Day Gifts (under $100!) for the Men and Women in Your Life! Valentine's Day is quickly approaching (insert "eeek" emoji here-- where did January run off to? ), and you want to be sure you're ready for the day with your significant other. Your SO could be a new beau in your life (fresh relationship) or it could be the man or woman you've vowed to spend the rest of your life with (Hi, MTF!). No matter if your relationship is days or decades old, Valentine's Day is a romantic day to go above and beyond the normal "showing you care" duties. My ND bestie, Caitlin, gave all her bridesmaids this amazing gift in 2013 when she got married to her ND love, Tom. At first, I hesitated to begin using it. I thought I had to wait until the beginning of the month or maybe even the first of the year. I finally went for it-- do not feel like you have to wait, that's the beauty of it-- you can begin your entries on literally any day of the year! It has been something I look forward to writing in each day. "If you could acquire a talent (without any extra effort), what would it be?" You answer the same question on that particular day for 5 years. It's so fun to see how it changes with each year! I often write down little tidbits, too, like "it snowed today!" because that's so bizarre for April 14! I am totally in love with these (under $50!) print bangles from Lilly Pulitzer. They'd be adorable for stacking with your lady's watch! It's a little bit of sunshine on her wrist in these long winter months. The doldrums of February can get you down, but with Lilly P's help, you can bottle some of that sunshine and wear it (near) your sleeve. Add some pizzazz to your love's iPhone. These new Kate Spade phone cases are perfect for Valentine's Day! She will think of you with every text she sends and every filter she puts on that selfie of you two! This option and this option are so adorable and romantic! Both links listed have a little bling on the phone case-- so fab! I just discovered Everfitte thanks to my friend Rachel! These tanks are comfortable, hilarious and perfect for hitting up Pure Barre classes or brunch and mimosas with friends. Here is a great one: somewhere between kale and cronuts (amen!). LOVE! Your gal will love your sense of humor! I just purchased this one: Barre Belle (totes appropes, right?). Check out The Bouqs online! It's a company founded by Notre Dame graduates, and we have had such great luck with their flowers. Every woman loves to receive flowers (any day of the year) but particularly on February 14. It's a fact of life! Bonus points to you, men, if you have them delivered to her place of work! For my birthday, Mike had a vase of my fave flowers (Gerbera Daisies) delivered to Villa Verone so they were awaiting our arrival! It was the kindest and most thoughtful gesture, ever! Men, good luck! (Bonus: 15% off your first Bouq and free shipping!). What I love About You book (you fill it in!). This is similar to the mom and dad books I mentioned in my Christmas gift ideas blog post (my mom just completed hers for me, and it is hilarious! I am savoring the entries, so I only read a few a day, but her "voice" comes through loud and clear! LOL!). This is personalized and a keepsake that your man will cherish for years to come. Mike has gotten into Randal Munroe's website, and he loves his books. 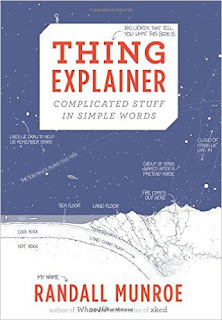 Thing Explainer: Complicated Stuff in Simple Words and What If: Serious Scientific Answers to Absurd Hypothetical Questions are two of Mike's favorites. These glasses cuff links are adorable for a man (like mine) who is always bespectacled. Pretty obsessed with these Millennium Falcon blueprint cuff links! And how darling are these Bow Tie cuff links? Any time your other half dresses up for an occasion, he will think of you buying him these fun cuff links! From any town you are reading this blog, there will likely be a brewery within 30 miles of you! You can sign up through the website (I highly recommend Penrose's brewery tour! You get a pint of beer for the tour and a growler to fill at a discounted rate). When we went on the brewery tour at Penrose, the brew-masters were incredibly knowledgeable. This event is interesting and memorable. Sometimes events are even more precious than tangible objects. (Hint: try Groupon for excellent deals!). Uncommon Goods has amazing glassware for the man in your life. I love these personalized tree trunk etched glasses. This is something your boyfriend/fiance/husband will treasure for years to come. Each time he sips his favorite Malbec or drinks his desired craft beer, he will think of the two of you. You can add initials and a date (first date, the day you met, the day you got married? The choices are endless) to the "trunk" on the glasses. What are you getting for your SO this Valentine's Day? This has to be the best list of gifts for men I've ever seen purely because of those cufflinks which are currently blowing my mind. I want them so bad. Thank you so much!! Aren't they epic?! Love those! Thanks for reading! Polka Dots and Lace: A Night Out with My BFF!